During the Eid holidays, we planned a trip to Failaka Island. After doing some research we found out about the Failaka Heritage Village package. They have a fairly decent arrangement and the boat ride itself is awesome. 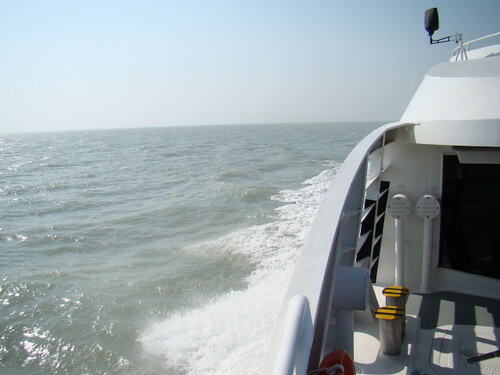 It takes about 50 minutes to get there and they have two nice boats (Bint Al-Khair and Umm Al-Khair). I found the boats to be very comfortable and in this weather it was excellent to go on the deck and really enjoy the ride. It costs KD.13/adult and KD.9/child. Children under 2 years old go free. The package mainly consists of the ride to and fro and a lunch buffet. 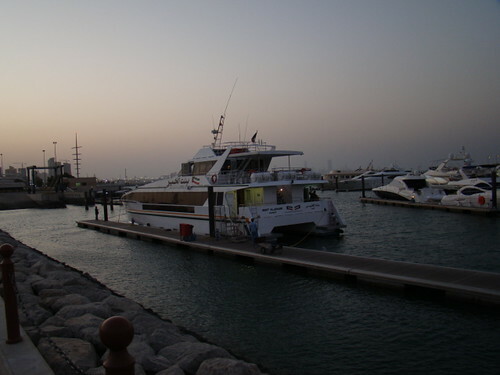 They leave at 10 am and return at 4 pm on Thu, Fri and Sat from the Marina Mall docks. For the remaining days its a 9 am departure and return at 5 pm. Once you reach the island they pile you in a bus and take you to the ‘heritage village’. This is where they hand you the lunch coupons and they’ve got some interesting stuff going on there as well. You can roam around and you’ll find camel rides, fun activities for children, play areas for kids, a mini-zoo of sorts and a boat ride in a beautifully decorated, yet small lake. If you come out of their premises you will notice that a lot of people are riding dune buggies. They rent them for KD.10/hour and its not too shabby. I’ve heard they also rent jet skis there but I didn’t explore enough to find them. They also rent out chalets if you plan on staying the night but personally I didn’t think there was enough action for a 24 hour trip. Rohail had a great time and thoroughly enjoyed the experience. I’d recommend people to try this out at least once because its a nice change from regular life here in Kuwait. I also got a chance to take a lot of pictures and try out my new Sony H50 camera. In fact, I’ve replaced the header image in my blog with a photo taken on this trip. Here’s the link to some more pictures.